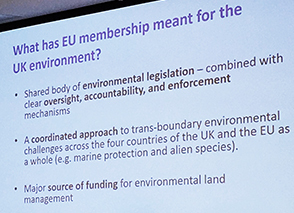 On Friday 12th of May SPERI, together with the Grantham Centre for Sustainable Futures, hosted a panel discussion ‘Brexit and the Environment – Opportunity or a threat?’. The event was part of the Festival of Debate and was well-attended by the public. The panel consisted of Dr Apolline Roger (Lecturer in Environmental Law at the University of Sheffield), Kate Jennings (Head of Site Conservation Policy at the Royal Society for the Protection of Birds), James Copeland (Environment and Land Use Adviser at the National Farmers Union, North-East region), and Paul Blomfield (Labour’s Parliamentary Candidate for Sheffield Central). The event was chaired by Daniel Bailey of SPERI. The panel opened with each of the panellists giving a short talk on their views on Brexit and the environment, bringing up points on where they saw the major threats and opportunities that Brexit may bring about for the British natural environment. The general consensus across the participants was that whilst there are many potential threats, it is hard to find opportunities though this is not impossible. The uncertainty brought about by Brexit featured widely, irrespective of the point of view the panellists represented. Once the panel had voiced their views, the floor was opened to questions from the audience which sparked a lively discussion. The discussion covered a wide range of issues including land use in farming, the European Union’s Common Agricultural Policy, the right scale of governance at which decisions about the environment should be made and whether it will be possible for the UK to have more ambitious and stricter environmental regulations post-Brexit, among many others. The event successfully increased awareness of the difficult and complex issues around Brexit and the environment that will unfold over the coming years.